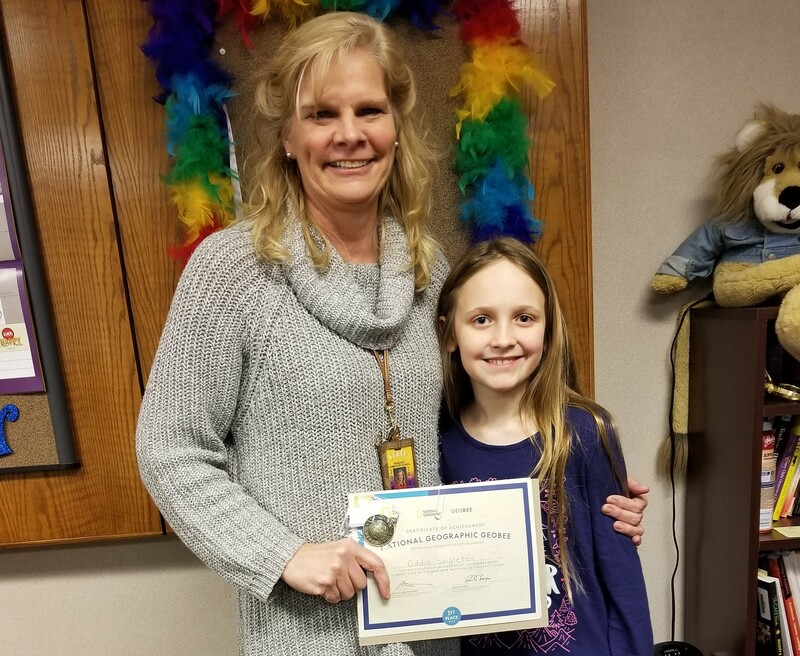 It’s been an eventful few weeks since Addison Singleton learned that she was the only 4th grader in the state to qualify for Friday, March 29th’s state competition of the National Geographic GeoBee! Addie has handled all the publicity and media interest like a pro—staying calm, cool, collected and maintaining her funny sense of humor! 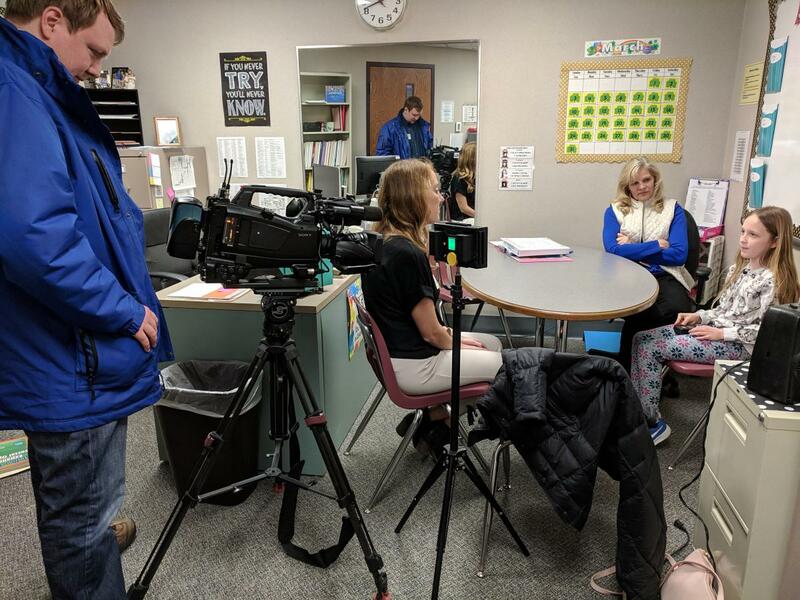 Leading up to the big day, she, her family, and 4th grade Geography Club Teacher Mrs. Ann Lira have been interviewed by local TV stations WNDU and WSBT (click to watch the stories), as well as the South Bend Tribune. Addie is heading down to IUPUI in Indianapolis tomorrow (March 29) for the competition representing Horizon. She’ll be up against fifth, sixth, seventh and eighth grade students across the state. Addison was was among Indiana’s top 100 scoring students! 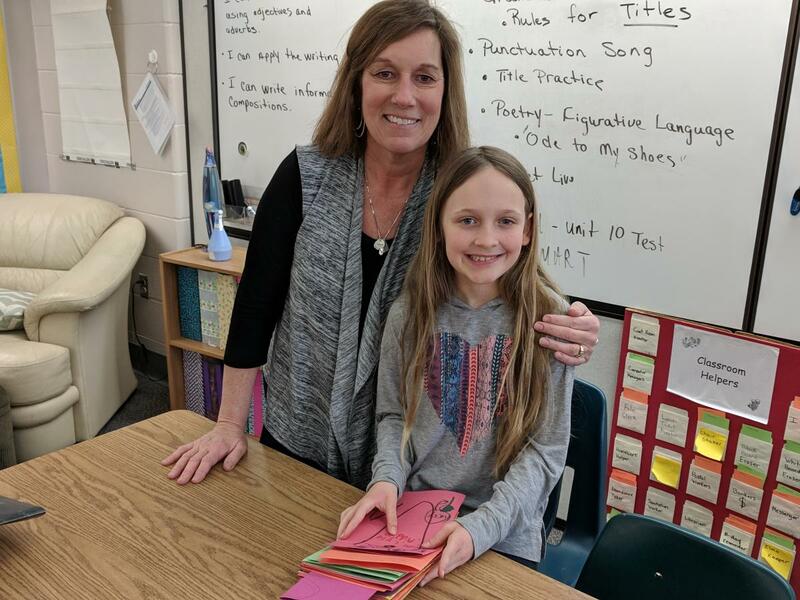 While being interviewed by the South Bend Tribune today (Thursday, March 28), Addie’s former 1st grade teacher Mrs. Joann Hartline brought in some “Good Luck” cards that students made her. 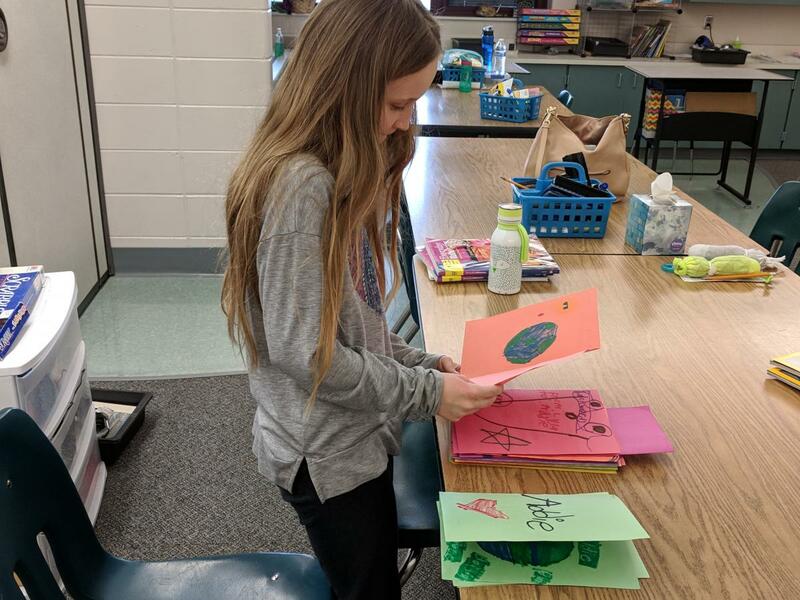 Addie has gotten a lot of support from her teachers, classmates and good friends. 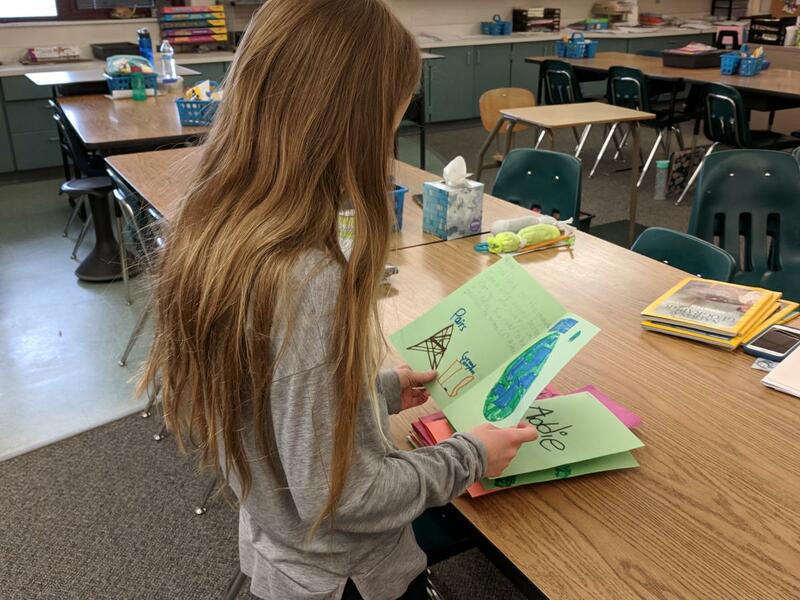 Two of her friends, Catie and Elle, have also been helping her study for the state competition. Using the national map painted on the back playground, Catie and Elle have been quizzing Addie on the states and state capitals during recess! Just another one of the many ways Addie has been preparing for the big day; she’s also been doing online quizzes and watching YouTube videos. It’s clear that the reason why Addie has done so well so far in the competition is because she loves history, geography and loves to learn! If Addie wins on March 29, she will win a medal, $1,000 in cash, and other prizes. The state winners well then go on to compete in the National Championship to be held at National Geographic Society headquarters, Washington, D.C., May 19-22. Students that come in second and third place in their state competitions will receive cash awards of $300 and $100, respectively. Seven runners-up will each receive $1,000 in cash. Visit the National Geographic GeoBee website for more information. We will keep you posted on Addie’s progress! 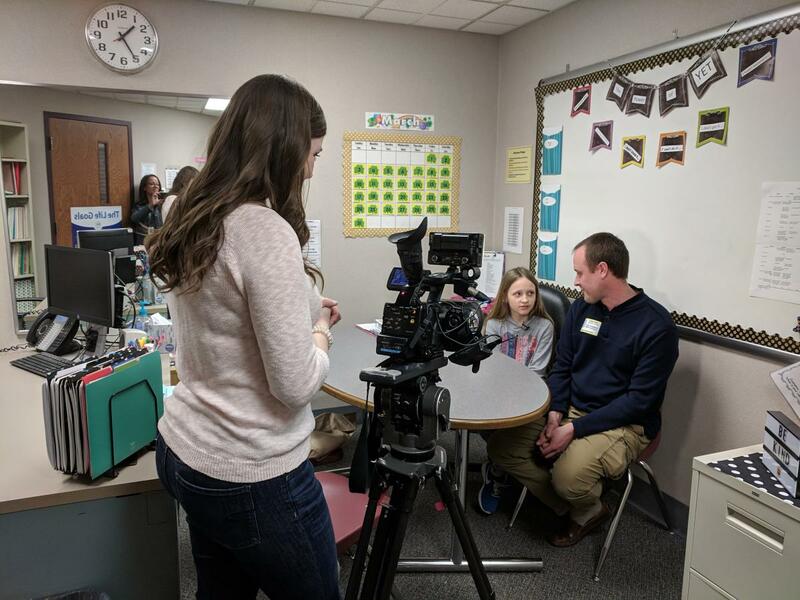 Horizon is one of Penn-Harris-Madison School Corporation’s seven “A” rated schools, a Four Star School and is among the state’s Top 25 public elementary schools!